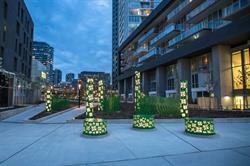 TORONTO, ON--(Marketwired - June 08, 2016) - Three of Toronto's latest public art pieces will be unveiled Thursday at Concord CityPlace. Variegation, Gardiner Streams and Drift are the latest pieces to be unveiled by Concord Adex, Canada's largest residential developer. These works add to Concord Adex's public art collection -- the largest in the country -- and showcase unique and inspiring work by acclaimed Canadian artists Pierre Poussin, Katharine Harvey and Adrian Göllner. "Our investment in public art is an important part of our commitment to building vibrant and sustainable communities, bringing together elements that shape a modern, complete neighbourhood," said Gabriel Leung, Concord Adex Vice President, Development. "It was a pleasure to work with all three of these world-renowned artists to showcase their exceptional artistic talent in Toronto." 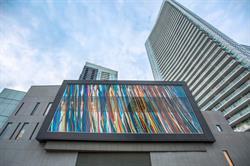 The unveiling will showcase Variegation, the second piece at Concord CityPlace by Canadian artist Pierre Poussin. 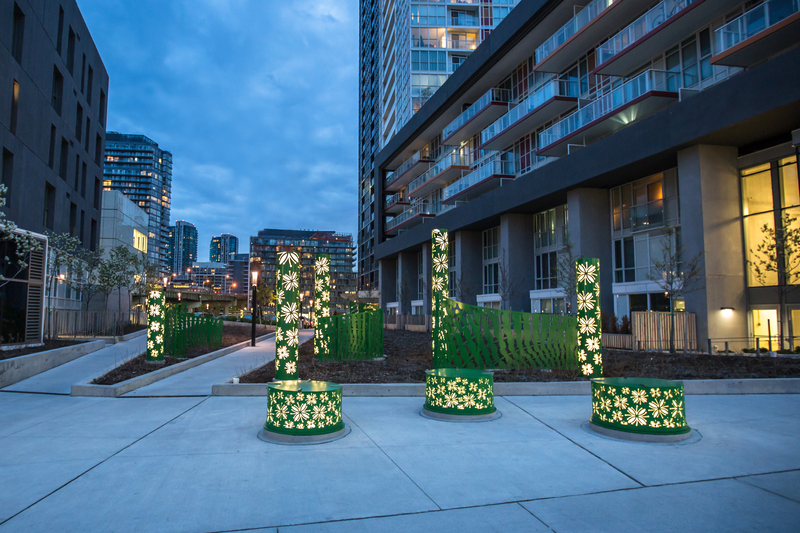 Inspired by local indigenous flowers, Variegation includes a series of laser-cut light columns, custom public seating and windscreens. Variegation mimics the plants' blooming process showing different colours of stripes and spots on the leaves and stems of plants as they grow. The piece reflects the area's history as the community continues to evolve. In Gardiner Streams, Katharine Harvey depicts the movement of the Gardiner Expressway -- an integral artery for people travelling in and out of the city. Using a digital camera on low shutter speed, the artist photographed the nearby highway at night with its relentless stream of cars. She collaged these blurred images together in a painterly manner, to echo the surging motion of the highway. 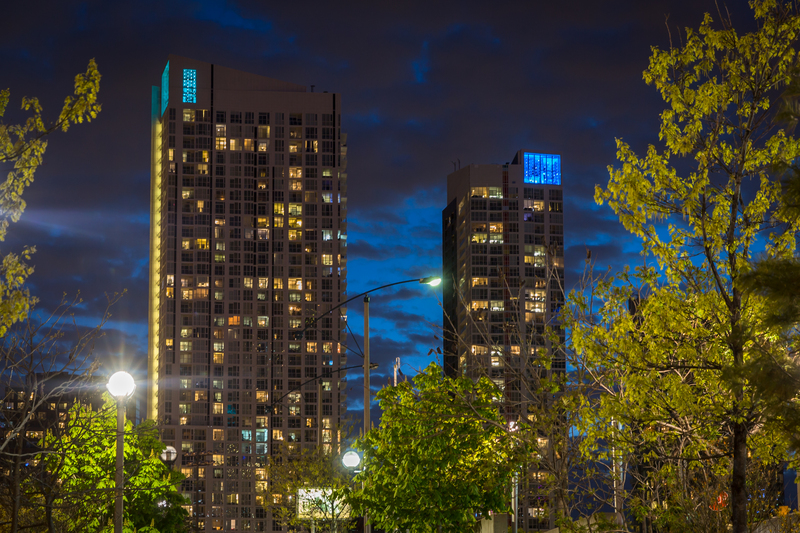 With Drift, artist Adrian Göllner enhances the visual dynamic between Concord CityPlace's Quartz and Spectrum towers through a nighttime lighting concept. Glazed sections at the top of each tower are aglow with slowly evolving cycles of blue, green and magenta illumination. As the length of the cycle is slightly different on each tower, the colours move gently in and out of phase with each other throughout the evening. Each of the three works contributes to impressive art lighting threaded throughout the public art display at Concord CityPlace. This is known as Warm by Night, which is a public art application on the roofs of the community's towers. The pieces help illuminate the collection at night and bring these spaces to life. Concord Adex is hosting an unveiling event for media on June 9, 2016 at 2:00 p.m. at 75 Queen's Wharf Road in Toronto. Gabriel Leung, Concord Adex Vice President, Development, Harold Madi, City of Toronto Director of Urban Design and Pierre Poussin, Katharine Harvey and Adrian Göllner will be available for interviews. I am continually intrigued by the wonders of plant biology and try to find ways to represent these features in my art. Inspired by plants that once grew in this area, Variegation is a tribute to Toronto's history as Concord Adex builds its future. Part of my creative process is taking aspects of daily life not conventionally considered beautiful and trying to make them magical. Gardiner Streams is my interpretation of something many take for granted -- an expressway that breathes life into the city every day. The concept for Drift was inspired by the design of the Spectrum and Quartz towers -- it's clear the project team saw the potential for enhancing the visual relationship between the two by adapting the roof lines. Drift takes full advantage of this design to create further cohesion between the buildings. Concord Adex is the largest residential developer in Canada specializing in urban communities. Over the past two decades, Concord Adex and its parent company Concord Pacific have built (and continue to build) the 200-acre Concord Pacific Place in Vancouver, the 50 acre Concord CityPlace in downtown Toronto, the 45 acre Concord Park Place in North York and other developments throughout Canada. Pierre Poussin is an internationally renowned artist based in Toronto. He has won a number of international design competitions including one to create LED street lighting, artworks and installations for Vancouver's 2010 Winter Olympics Public Art Program. Variegation is his second piece with Concord Adex. In 2010 Poussin finished Mitosis at Concord Adex's Panorama Tower. Katharine Harvey is a Canadian visual artist, painter and sculptor. Harvey won the People's Choice Award at the 2008 Nuit Blanche festival in Toronto for her work titled Waterfall. She holds a Bachelor of Fine Arts from Queen's University and Masters of Fine Arts from the University of Victoria. Her work is represented by the Nicholas Metivier Gallery in Toronto and Galerie Borchardt in Hamburg, Germany. Adrian Göllner is an award-winning contemporary conceptual artist. Since graduating from Queen's University in 1987 with a Bachelor of Fine Arts, Göllner has maintained a fine art studio in Ottawa and has exhibited extensively. He has received a number of public art commissions in cities around the world including Ottawa, Toronto, Vancouver and Berlin. Drift is part of the larger Warm By Night rooftop lighting commission, which Göllner has been pursuing with Concord Adex since 2002.